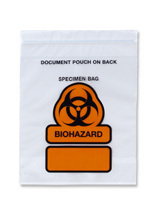 Sure-seal zipper bag holds specimen and protects against accidental spills. Separate document pouch keeps documents with specimens during transport and storage. Meets current labeling requirements of OSHA standard 29CFR1910.1030 regarding biohazard symbols. Pouch size is 8" x 8-1/2".